Badges are a common feature of many different types of application, including game apps and learning apps. They sometimes go by different names, but the principle is the same – you get a badge or similar reward for completing various tasks. In the language learning app Duolingo, for example, badges are called Achievements. You can, for example, earn an Achievement by going through lessons on consecutive days. You can also earn Achievements by completing lessons without getting a question wrong, by following friends, and more. The purpose behind badges and rewards like the Duolingo example is to encourage and motivate learners by recognising their progress, while also making learning more interesting and fun. What Are Badges and How do They Reward Learners? Badges are virtual and, in most cases, exist only within the e-learning course, i.e. they don’t have any external value. As mentioned above, the most common set up is for learners to earn badges by completing pre-set tasks. Examples could be to complete a set of e-learning course modules, a quiz on a particular topic, or a task within the course. The basic role of badges within the e-learning course is to highlight the fact the learner has completed a task or has acquired specific knowledge or skills. While the above is simply an example, it illustrates the sort of options you can implement to create a badge-based reward system in your e-learning course. What is the purpose of doing so, however? Are learners really interested in earning a virtual badge that has no tangible (i.e. monetary) value? How do badges and virtual rewards motivate learners? The benefits of badges outlined below will answer these questions. Provides encouragement to learners – this is the primary purpose of adding badges to e-learning courses. After all, when you present people with a task or goal, they will try to achieve it. You can use this natural human inclination in your e-learning courses, i.e. if you create a badge, your learners will try to achieve it even if doing so gets them nothing but a virtual badge. Gives learners a sense of achievement – your learners will also feel good when they receive a badge. That feeling comes from a sense of achievement. In addition, this sense of achievement will motivate them further to work towards getting more badges and rewards. Gives learners public recognition – if you include a social element in your e-learning course, you can also make the badges that learners earn publicly visible to other learners and colleagues. As most people want public recognition and acknowledgement for their achievements, this will also help engagement and motivation levels. Encourages healthy competition – you can take the above point a step further by adding in an element of competition. For example, offering a real-world prize (an extra day off, for example) for the first learner to successfully receive all badges. Makes the e-learning course appear more achievable – this particularly applies to long or challenging e-learning courses. These can appear daunting to learners, especially if all they can see is the amount of work they will have to do to complete the course. Offering badges for small, incremental successes, however, effectively breaks the course into chunks. This is much less daunting, plus focusing on and celebrating small successes is a great motivator. Personalises the learning experience – one important general benefit of e-learning is you can personalise the learning experience. This makes courses more relevant to individual learners and increases engagement rates. 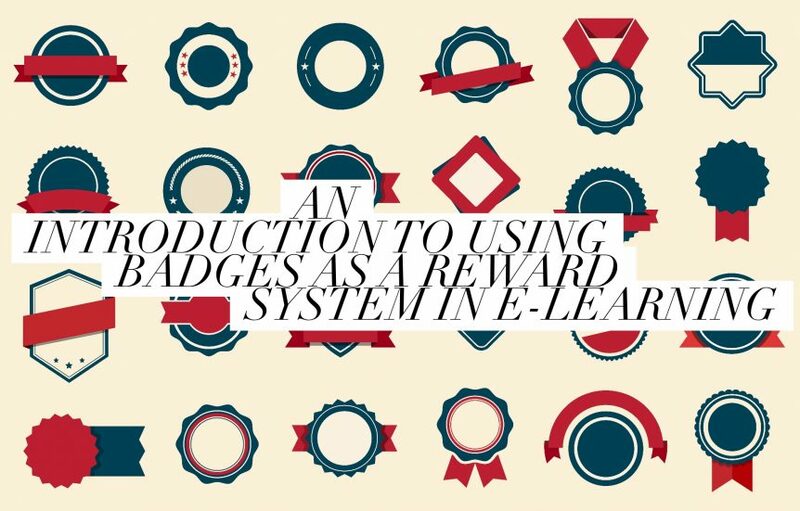 Using a badge-based rewards system is one of the methods you can use to enhance the personalisation of your e-learning courses. Finally, badges don’t have to be complicated. In fact, the simpler you can make the badge-based reward system, the better it will be, not least because it won’t distract your learners. Instead, it will enhance the overall learning experience.